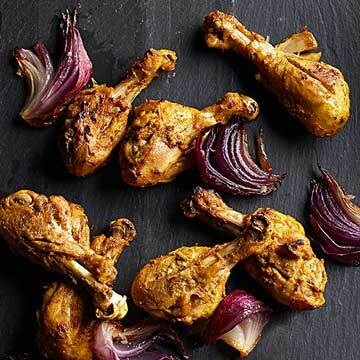 For marinade: In a medium bowl, combine yogurt, 2 tablespoons of the oil, the lemon juice, ginger, garlic, cumin, 1 tablespoon of the kosher salt, the turmeric, coriander, garam masala and cayenne pepper. Using a paper towel to help grip, remove and discard skin from drumsticks. Make 3 or 4 slashes in the meaty part of each drumstick. Place chicken in a large resealable plastic bag set in a shallow dish. Add marinade, seal bag and rub the marinade over chicken and into the slashes. Refrigerate bag 4 to 6 hours (not more). Preheat oven to 450 degrees . Line a 15x10x1-inch baking pan with foil; place a rack over foil and lightly grease the rack. Shake excess marinade from chicken and arrange chicken on rack. Brush chicken with half the butter; roast 20 minutes. While chicken is roasting, gently toss onion wedges with the remaining tablespoon of oil and arrange on a foil-lined 15x10x1-inch baking pan. Season with the remaining 1/4 teaspoon kosher salt and the black pepper. Turn chicken, brush with remaining butter, and return to oven with the pan with the onions. Roast both until chicken juices run clear (at least 175 degrees ), and onions are charred and crisp-tender, 20 to 30 minutes. Transfer chicken to platter; let rest 10 minutes. Serve chicken with onions and lemon wedges.